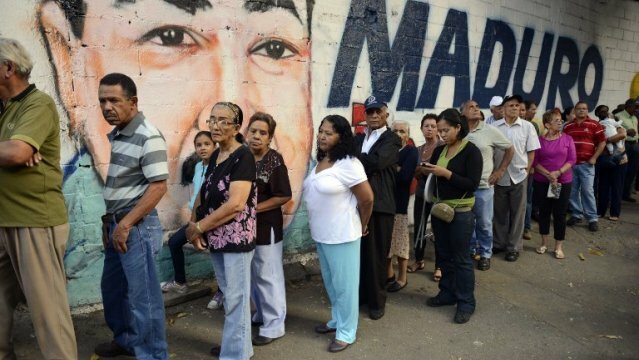 There is a long-standing consensus that chavismo will eventually collapse under its own weight – the economic situation making this scenario more and more plausible. Still, waiting for a seemingly inevitable implosion is not much of a strategy. One of the mysteries of the past few months is what exactly the opposition is doing to proactively precipitate this process. Everyone agrees that this administration is inefficient, corrupt, and that Venezuela is going through tough economic times. The shortages hold public life hostage to queuing in endless lines, but discontent – in the absence of clear alternatives – becomes compliance, conformity, survival. The opposition does not seem to speak to this weariness by offering an alternative. Complaisance seems unacceptable to many of us, and it directly opposes the legitimate outrage and indignation that the opposition thinks should be felt. But this outrage creates a deep chasm between us … and the people we think should be outraged. Unconditionally, yes. “Do they share elemental values with us?” Does it really matter? It’s not like we can wish our differences away (even though, Chavismo would have you believe it is totally possible). In the end, the issue of engaging swing voters is not really a question of negotiating “respect”, it’s about the recognition of opinions, sincere dialogue, and reconciliation. The problem is that the very legitimate anger about indifference has made way for a yearning to change the only variables we actually can’t – cultural ones, mostly. But we will never truly engage swing voters if we do not speak to them about what we stand for, what we see, and what we offer. Most of the people that support this administration by lending their vote long for alternatives but do not trust the blind spot beyond the status quo. The line of thought is based on real materialistic needs of a people spoiled by a political culture of give-aways. What will a next government do for me? they seem to be asking when standing in line, arrechos with the government. The answer is hard to come by because earnest policy alternatives are scarce. Pickings will be slim in any realistic long-term scenario, and opposition parties cannot keep avoiding the sore spot out of fear of scaring voters. It seems our opposition parties are either badgering an issue to death, or ignoring it. Both strategies can be easily overplayed. I have given up on most politicians who have deadlocked themselves and their followers into confrontation-based politics by completely stepping into the Chavismo discourse, only existing in the constructed narrative, and failing to come up with any long term policy plans. A people that have gotten used to clientelism will be harder to convince, but politics that has no basis in policy is populism, which is the last thing anyone should want to challenge Chavismo with. The opposition needs to provide more substance than it has. This raises an important question: is there a market for non-populist leadership in an authoritarian zero-sum state? Well, I believe there is. After all, if you can’t fight fire with fire, why would you be able to fight populism with populism? Everything else has failed. It has been suggested that the opposition has been kept so busy trying to keep up with Chavismo it has never gotten to long term policy planning. It’s certainly outdone by way of the communicational hegemony, but the media that is available to the opposition is only used for venting. There is also little follow-up on long term political debates. But that is as much because chavismo has forced us as it is because of the opposition’s unwillingness to engage in serious policy debates. Take last Thursday’s decreed laws. Good chance you had completely forgotten about the Enabling Law, but don’t feel bad – apparently the entire opposition forgot too. It is hardly the first time it’s happened, so why did the opposition not use the opportunity to build momentum? Venezuela does not have a political alternative to Chavismo in the sense that there are no clear policy proposals to choose from. Neither the opposition parties nor the opposing minority as a whole has been able to formulate clear policy alternatives to challenge the current establishment. This has become a much more pressing problem now that the majority of the ruling party has become so small. It is quite obvious that the opposition cannot formulate policy alternatives because the MUD is not a policy-based political party, it is a convenient coalition of political parties. Functional, effective democracies depend on accountable political parties, leaders or social movements who represent the interests of the electorate and project these needs and aspirations into realistic policy proposals. Political outrage in Western democracies usually revolves around budgets and social spending. Accountability is a big deal when governments run on tax money, but in Venezuela the government’s budget is 96% oil money. When it’s not the taxpayer’s buck that’s being gambled, accountability is less of an issue. The opposition needs to man up, be honest, and formulate policies that dismiss rentista tradition and push people to work to crank up production soon. Dismissing an actual sustainable attitude because the current government undermines democracy has not gained it much ground. The opposition has made it clear elections will be the way out. If so, is it wise to simply wait for the government to slowly rot in order to take the win? How will we justify this? Will we sell the idea of keeping a fantasy alive, where we just switch administrations, keep everything else, and everyone lives happily ever after?